The November night sky of 2014 brings some amazing skywatching sights for observers, including the peak of the Leonid meteor shower, and a grand conjunction of six solar system objects.The moon will appear close to Uranus, and Mercury will be at its best placement in the morning sky all year. Here's a look at sky maps for some of the most promising night sky events this month, courtesy of Starry Night Software. Thursday, Nov. 6, 5:23 p.m. EST. The Full Moon of November is known as the “Beaver Moon” or the “Frosty Moon.” It rises around sunset and sets around sunrise; this is the only night in the month when the moon is in the sky all night long. The rest of the month, the moon spends at least some time in the daytime sky. Friday, Nov. 14, 10:15 a.m. EST. The Last Quarter Moon rises around 11:00 p.m. and sets around 1:00 p.m. It is most easily seen just after sunrise in the southern sky. Saturday, Nov. 22, 7:32 a.m. EST. The moon is not visible on the date of New Moon because it is too close to the sun, but can be seen low in the east as a narrow crescent a morning or two before, just before sunrise. It is visible low in the west an evening or two after New Moon. Saturday, Nov. 22, 7:32 a.m. EST. The First Quarter Moon rises around noon and sets around 11:45 p.m. It dominates the evening sky. Mercury at greatest elongation west. Saturday, Nov. 1, dawn. Mercury will be best placed in the morning sky for the entire year. Look for it low in the eastern sky about half an hour before sunrise. Uranus and the Moon. Tuesday, Nov. 4, 1 p.m. EST. 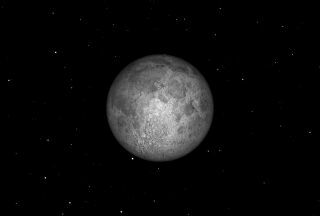 The nearly full moon will pass just north of the planet Uranus at 1 p.m. By the time it gets dark in eastern North America, the moon will have moved eastward, but will still be close enough to Uranus to make the planet easy to spot. This chart shows the positions of the moon and Uranus at 7:30 p.m. EST. Aldebaran and the Moon. Saturday, Nov. 8, 8 p.m. local time. When the moon rises tonight in the northeastern sky around 8 p.m. local time, it will be close to the bright red giant star Aldebaran and the Hyades and Pleiades star clusters. Leonid meteor shower peaks. Monday, Nov. 17, 6 p.m. EST. The peak of this meteor shower occurs at 6 p.m. E.S.T. when the radiant is below the horizon in North America. The radiant rises in the northeast at midnight local time, but meteors may still be seen. The best meteors are visible about 90 degrees away from the radiant. Grand conjunction. Saturday, Nov. 22, 7:32 a.m. EST. On the morning of Nov. 22, six solar system objects will be packed into an area of the sky less that 20 degrees wide. Centered on the sun and the New Moon, the planet Venus and dwarf planet Ceres will be to the east of the sun, and the planets Saturn and Mercury will be to the west of the sun. Unfortunately, the bright sun will make it impossible to see any of these objects except the sun itself. Mercury will be well placed in the morning sky for observers in the Northern Hemisphere for the first half of the month. Venus is too close to the sun to be observed all month. Mars is now in Sagittarius, closing in on the sun. Jupiter now rises in the late evening in the constellation Leo. Saturn is in conjunction with the sun this month, so cannot be seen. Uranus is well placed in Pisces in the evening sky. A close approach by the moon on the 4th will make it easy to spot. Neptune is well placed in the early evening sky in Aquarius, and sets near midnight. This article was provided to Space.com bySimulation Curriculum, the leader in space science curriculum solutions and the makers of Starry Night and SkySafari. Follow Starry Night on Twitter @StarryNightEdu. Follow us @Spacedotcom, Facebookand Google+.